Amazing how that works, we were just discussing this lift a few weeks ago given that she’s now 30 years old. I’ve not skied up there yet, but from looking at the trail map, it looks like it really is the only access to the upper mountain, which seems a bit awkward given that if this thing ever goes down for a few days in the season or on a weekend, they are screwed. Christie Peak Express and Thunderhead provide backup, but I wouldn’t want to be there with the gondola down on a big day. Your right, as I look at the map closer I guess Christie III can be used as well to help deposit skiers over to the Thunderhead area. It would be nice if there was a HSQ that got people from the base area up to the base area of Elkhead & Sundown. Bashor Bowl gondola may be in the plan, but that doesn’t change the lower mtn bottleneck is the gondola goes down. It just puts more people at Thunderhead HSQ base more quickly. Thunderhead likely to be upgraded to a HSS if the master plan is implemented, but direct access from base to Sundown/Elkhead would be the only real solution, especially given proposed expansion at Sunshine Peak. 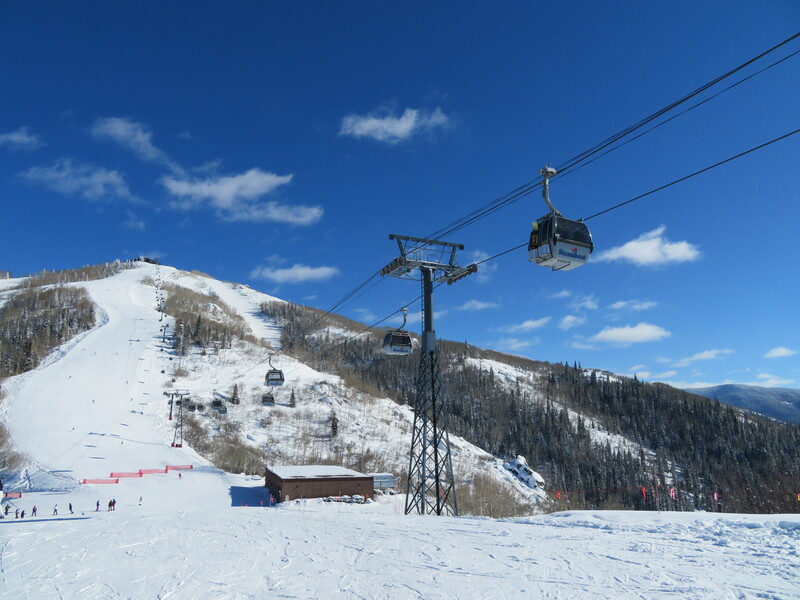 Doppelmayr upgraded Telluride some years ago in a similar way with agamatic grips and new rails/ tire banks. I think the issue at Telluride is that the gondolas stack up so many hours annually that even the refitted equipment will need a refit. Im glad resorts do these mechanical upgrades while keeping the lift the same for the skier. It preserves the character really well. I believe kids on the internet use the term “FINALLY” to describe situations like this. Those first gen Omega cabins sure have a low ceiling compared to present day hardware. I’m fairly sure they are actually keeping the original cabins. What are the Pros/Cons of tires vs the chain driven system that the Boat currently uses? Maybe a mechanic who’s worked on one with chains can chime in. Pros are 1) Less moving parts- no gearboxes, drive shafts, u-joints, chains, etc. 2) Less maintenance for those components. Cons- 1) Possibility of slippage IF the PTO sheaves aren’t correctly loaded. 2) Possibility of slippage IF the PTO sheaves and / or haul rope get icy. Are they going to upgrade the line speed during this? That lift is definitely long enough for 1200 fpm. I doubt it, the industry seems to be moving away from 1000+ line speeds. Well tell them to knock it off. Some lifts need that 1000+ FPM! 1000+ FPM has proven to be too hard on the equipment available in today’s technology. Then what about yesterday’s technology, the high speed lifts installed in the 80s and 90s? Or is that the technology we are referring to in this day and age? I mean this with all sincerity, I’m trying to learn here. After re-reading this thread, it could be a possibility to upgrade to 1200 fpm for this Gondola. The question is: Is there enough room in the present buildings to install a longer terminal? Not sure what the tire count is at present, but faster line speeds dictate more tires to accelerate and decelerate the cabins smoothly. As for detachable chairlifts, the move away from 1100 & 1200 fpm was a result of the same issue- you need a longer terminal (35 tires vs. 27 tires) to properly accelerate/decelerate the carriers and it wasn’t woth the expense for a 10% increase in capacity or 10% reduction in ride time. Poma’s Competition 1100 used the 27 tire terminal and the 10% increase in speed had an adverse effect on the wear of grips, tires, belts pulleys and carriers. I think a lot of the customers eventually turned them down to 1000 fpm. Again, JMHO. Am I the only one who thinks the Bashor Gondola is a bad idea? It feels to me that Steamboat already has a sufficient learning area (Headwall) and all this does is add more pressure on Thunderhead for transport up the mountain. Instead of installing the Bashor Gondola I think they should keep the current configuration but be more ambitious with replacing the Steamboat Gondola. At a minimum they should upgrade it with a 10-MGD at 3600 PPH. I also think they should consider a Funitel or 3S as whatever they install is going to be there for 30-50 years. Haul rope is back up on the Gondola. 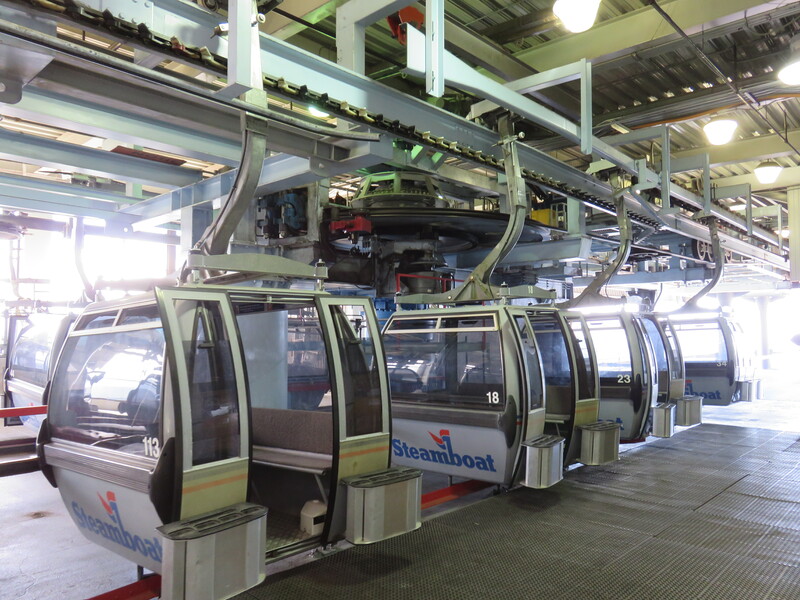 Cabins are still off and I’m guessing still lots to do in the terminals as they are not anticipating the Gondola running for summer ops until about July 15th.